Écoutez. 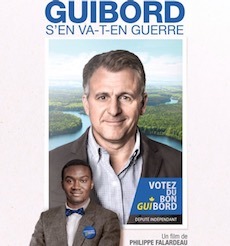 Voici un nouvel épisode de la baladodiffusion <<Filmed in Canada.>> William and Alexander are suddenly bilingual for their discussion of Philippe Falardeau's 2015 political satire My Internship in Canada. Could this movie be any more Canadian -- whatever that means? Téléchargez cette émission immédiatement. In the second half of the episode Tony Zhou and Taylor Ramos, creators of the YouTube channel Every Frame a Painting, visit the studio to talk about their video essays. Our chat with them starts at 45:00 and doesn't stop until we've touched on "Vancouver Never Plays Itself," visual literacy, Jackie Chan, Louis C.K. and Edgar Wright, among other topics. Find details about the movies discussed in this episode by viewing the IMDb pages for My Internship in Canada, Horace and Pete, Le Bonheur, Tampopo and Police Story 2. Check out the video essays by Tony and Taylor on YouTube. Muggle isn't a condescending term. Mudblood is, though. Haha, I realized this after the fact upon reflecting more on my Hambrey Pobre knowledge (which is limited). Point is, William was out of line, and I needed to let him know it! Thanks for checking in, and for listening Jimmy!